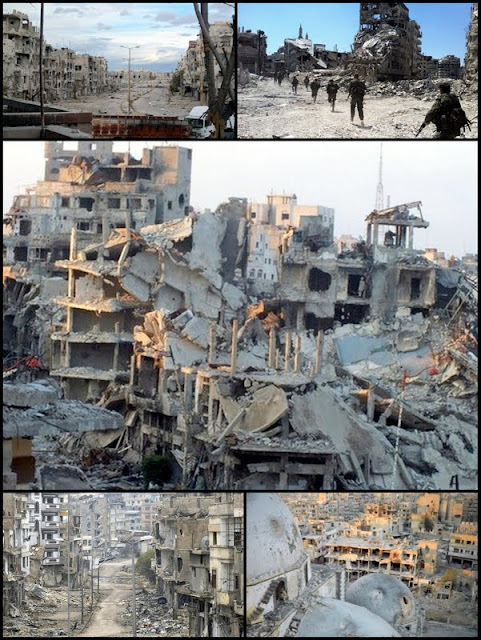 ArabSaga: After Khalidiya, is Assad winning the Syria war? Hyped media reports that the regime of President Bashar al-Assad is winning the Syria war are misplaced, according to Egyptian military and strategy expert Safwat el-Zayyat. The reports follow the fall of Khalidiya, a neighborhood in Homs city, to Syrian government forces backed by Shiite militiamen from Lebanon, Iran and Iraq. Seven weeks earlier, these combined forces retook Qusayr, a town some 35 kilometers from Homs city on Syria’s border with Lebanon. The regime is not in a position to contend with two battlefronts at the same time. After retaking Qusayr (on June 5), the regime turned swiftly to Aleppo. News agencies started saying regime and Hezbollah forces were knocking on Aleppo city’s door and preparing to overrun the nearby villages of Nubul and Zahra. Four days later, we saw regime and Hezbollah forces refocusing on Homs, instead. Homs city has been under siege for 442 days. It took the regime 442 days to forces its way into just one of the city’s numerous neighborhoods – namely, Khalidiya. I believe the armed opposition’s unified command gives priority to the attrition war. For now, it is concentrating on the Aleppo and Deraa fronts. More thrilling perhaps is the Damascus front, where the armed opposition seems to have decided to switch its main thrust from Eastern Ghouta to try and reach Abbasid Square, (a landmark plaza) in central Damascus. Also, three days ago, regime forces were set to swoop on Qaboun (a neighborhood of Damascus held by the rebels). Suddenly, regime forces pulled back from around Qaboun and Jobar and started evacuating citizens from the Qassaa, Ghassani, Qusur, Fares el-Khoury and al-Tijari areas of Damascus to safer neighborhoods in the capital, including Muhajereen and Ruknuddin. The closer the armed opposition gets to the center of Damascus, the less likely the regime’s recourse to carpet shelling and bombing of the capital’s rebel-held areas. On the Aleppo province front in northern Syria, the armed opposition captured the key town of Khan al-Asal six days ago. They have since seized Dhahret Abd Rabbo and are no more than 200 meters away from the Air Force Intelligence building there. Dhahret Abd Rabbo will allow the armed opposition to control the Aleppo-Aintab motorway, which links them to Aleppo city, Nubul, Zahra and Minnigh all the way to the border crossing (with Turkey) at Bab al-Salam. The opposition’s advances in Deraa province are even more spectacular. The rebels now hold the major towns of Nawa, Inkhil and Jassem there. The entire city of Idlib will come under their control once they flush out regime forces from the neighborhood of Manshiyeh.